Planning any type of event that brings people together is hard. But larger scale events, like you’ll find for bigger churches and businesses, can be a downright nightmare to coordinate. That is, unless you get some professionals in your corner to help with the major event features. Here at Rythm EFX, we are the best around at setting up and running LED video walls, IMAG, event props, and more for church and corporate events in Denver and the surrounding areas. If you would like to turn your church or corporate event into the talk of the town, we can help you create an experience that will be hard to beat. Here is a little more information about the services we offer. Think LED video walls and lighting services are out of the budget range for your event? Think again! These technologies have made great strides, and now fit within just about any budget if you know where to look. Not only are they more affordable than ever, but they boast cooler features too. Our LED walls have greater flexibility and more shape options available than ever before. We have the latest and greatest in equipment for you to choose from, and we operate it throughout the entire event. You have plenty of options for shooting styles, and we can prerecord videos as well to set up the perfect LED experience. IMAG, or image magnification, is a service wherein a speaker or event feature is broadcasted on a video feed behind them, but with the image magnified for better visual acuity. But it goes far beyond simple magnification. The operator of IMAG equipment can focus in and out on any feature of your event, giving event goers a direct line into any pertinent event activities. There are all kinds of benefits to IMAG equipment, most notably an increase in communication as listeners can match the words they hear to the mouth movements on screen. This visually pleasing, helpful event service makes a grand, if subtle difference; after your first time using one, you’ll never want to host an event without one again! What is it that will make your event unique? If you can’t answer that question off of the top of your head, it’s probably a good idea to go back to the drawing table. Here at Rythm EFX, we offer all kinds of event props for church and corporate events. Want a custom stage prop for your church event, perhaps one that helps illustrate a point from scripture? We can craft a custom prop just for your event, one that will make it memorable for years to come. Did you hire a DJ for a fun corporate event? We can create them their own custom DJ booth to help them set the tone for the entire event. Or maybe you need an entire theatrical set constructed, complete with lighting, custom backdrop, and props, to control every aspect of your event’s ambiance? We can handle any and all of these scenarios. We have all kinds of special effects services here at Rythm EFX to make your event a night to remember. You can choose from foam party rentals, CO2 cryo effect fog machines, confetti and streamer blasters, and stage pyrotechnics. These are those extra features that can take your event from merely a fun and enjoyable time, to a great night to remember. Flashy, entertaining, visually pleasing, our special effects are great tools to hold your guests’ interest and funnel them to different event features that you are hosting. 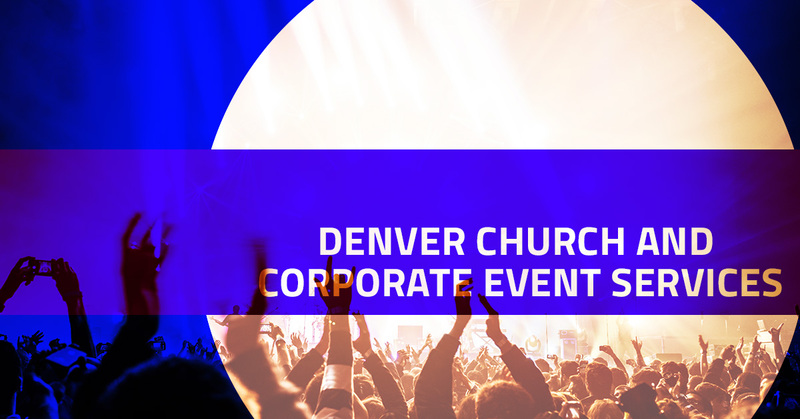 Have we convinced you about how effective our Denver church and corporate event services are? We are proud to help organizations all across the Denver area create epic events to enjoy and remember. If you are looking for more information on how our event services can benefit your organization, please do not hesitate to give us a call at your earliest convenience. One of our friendly and knowledgeable representative will be happy to answer any questions that you may have. We look forward to hearing from you!